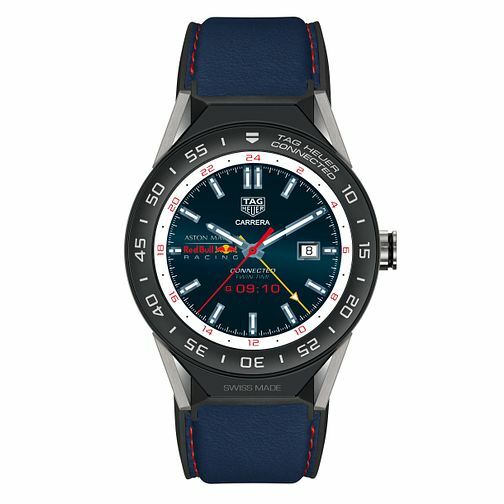 As TAG Heuer's first smartwatch, the Connected Modular 45 uses a customised version of Google's Android Wear platform to bring luxury design to wearable technology. Having inherited much of its DNA from the sports chronographs, there are three interchangeable digital watch dials, a blue leather strap, and a titanium case. One of the only luxury smartwatches on the market. This TAG Heuer Connected Modular 45 Red Bull Racing & Aston Martin Men's Smartwatch comes equipped with a 45mm case, which houses the handmade quartz movement that provides the power. Attached to the case is a calf skin leather strap for increased comfort on the wrist. This timepiece is water resistant up to 50 metres.